Health care tends to revolve around treating illness, injury, or disease. At OSI Physical Therapy we are trying to go beyond treatment of injury or disease to include improving health with our Training Room programs and education of our patients to keep active and improve fitness beyond their time in Physical Therapy. Maintaining a healthy state takes knowledge about lifestyle choices as the vast majority of our lives occurs outside of Physical Therapy or doctor’s offices. 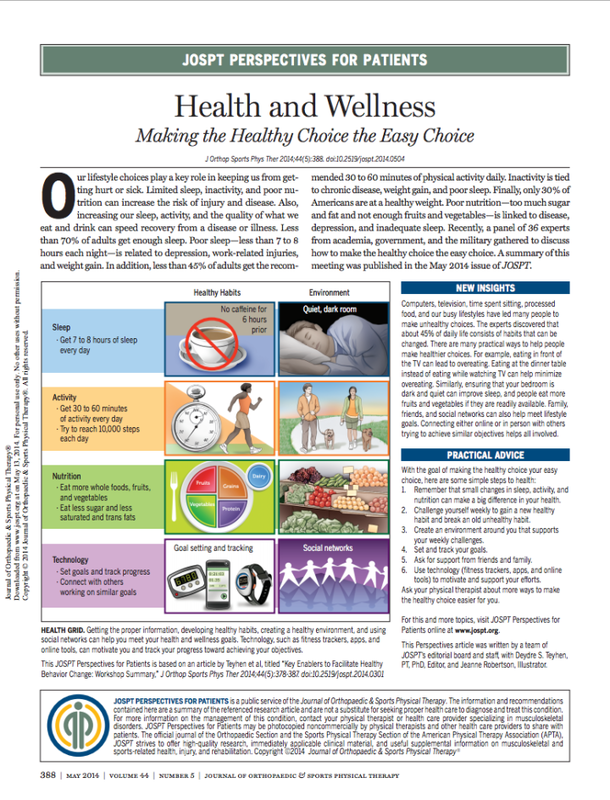 The emphasis of maintaining health needs to be focused on sleep, activity/exercise, and nutrition. The following link is from the May, 2014 Journal of Orthopaedic & Sports Physical Therapy (JOSPT) Perspectives for patients. May, 2014. Journal of Orthopaedic & Sports Physical Therapy (JOSPT) Perspectives for patients.